GoodReads Summary: Kira Walker has found the cure for RM, but the battle for the survival of humans and Partials is just beginning. Kira has left East Meadow in a desperate search for clues to who she is. That the Partials themselves hold the cure for RM in their blood cannot be a coincidence--it must be part of a larger plan, a plan that involves Kira, a plan that could save both races. Her companions are Afa Demoux, an unhinged drifter and former employee of ParaGen, and Samm and Heron, the Partials who betrayed her and saved her life, the only ones who know her secret. But can she trust them? Bursting with action and excitement Fragments deserves all the stars (or hearts in this case), I honestly can't praise it enough! Sounds interesting. I received Fragments from NetGalley, but I have to read Partials first, of course. Glad to know I'm not going to be wasting my time! I haven't read Isolation and I had no idea it was about Heron, but I found her intriguing enough in Fragments that I'll definitely get a copy as soon as possible. I think I enjoyed this one slightly less than you did. I felt that it dragged a bit, especially around the middle, and that it could have been edited down considerably, but overall, it was pretty enjoyable. I love it when a book is genuinely unpredictable. I feel like far too many are formulaic and easy to pinpoint. This sounds like a great sequel, and I'm glad it exceeded your expectations. :) I still need to read book one! Oh yay! I have Partials, but I havent gotten to it yet. But im so happy that this was able to exceed your expectations!! Its also great that you got to see a different part! Lovely review Renu! I haven't started reading this series yet but I think I will soon. 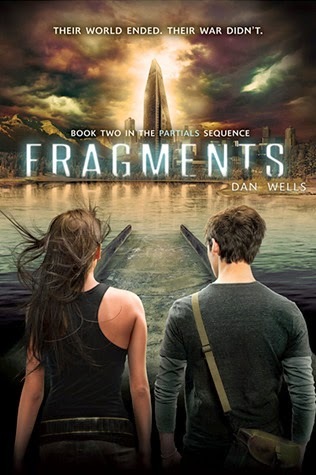 I loved Partials, so it's exciting to read that you think Fragments is even better. I can't wait to experience the ending for myself. Thanks for keeping your review spoiler-free! Oh wow! Excited to read this. I enjoyed the first book :D Thanks for the fab review. *starts screaming hysterically* I NEED this now!!!!!!! Great review!!! *-* I so want to read it, even more now!!! I haven't read Partials yet but this sounds like a super solid sequel. I'm curious about the plot twists and yay for a subtle romance. I haven't read Partials yet but I'm really happy that the sequel exceeded your expectations, Renu. I look forward to finding out about the plot twists in this one. YAY I'm glad you loved this one so much! I haven't read any of the books in this series but I probably should get on it soon! Unpredictability sounds like an amazing quality! So glad you enjoyed it! And I didn't know it was on Netgalley! I'm really looking forward to Fragments. I loved Partials and apparently this is even better... *heck yes* Thank you for the review-looking forwards to starting htis one even more now!